Monitoring patient-reported outcomes to capture CKD’s effects on health-related quality of life (QOL) is important for population health and individual care. Current measures such as the Kidney Disease Quality of Life-36 (KDQOL-36) do not incorporate some proven measurement advances, and measures incorporating such advances are rarely compared with current methods. The authors evaluated the validity of a new approach to CKD-specific QOL measurement that comprehensively represents CKD-specific QOL, yields a single summary QOL impact score, and generally requires only 1 minute. Across CKD stages 3–5, dialysis, and transplant patients, results favored the new approach over the KDQOL-36 in comparisons of validity, including responsiveness (sensitivity to clinical change), across multiple clinical tests. Computerized adaptive test versions of the new approach were more efficient than static versions. Background Patient-reported outcome measures that are more practical and clinically useful are needed for patients with CKD. We compared a new CKD-specific quality-of-life impact scale (CKD-QOL) with currently used measures. Methods Patients (n=485) in different treatment groups (nondialysis stages 3–5, on dialysis, or post-transplant) completed the kidney-specific CKD-QOL and Kidney Disease Quality of Life-36 (KDQOL-36) forms and the generic SF-12 Health Survey at baseline and 3 months. 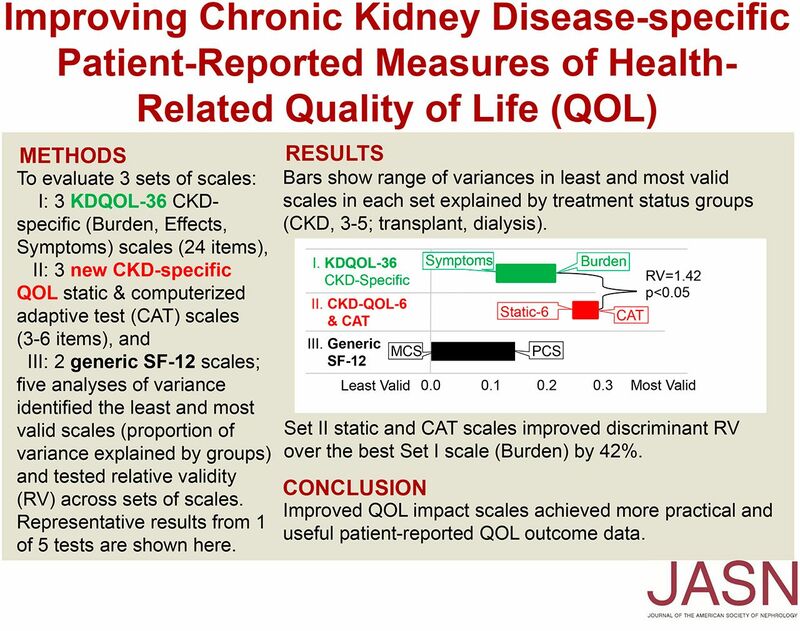 New items summarizing quality of life (QOL) impact attributed to CKD across six QOL domains yielded single impact scores from a six-item static (fixed-length) form and from computerized adaptive tests (CATs) with three to six items. Validity tests compared the CKD-QOL, KDQOL-36 (Burden, Effects, and Symptoms/Problems subscales), and generic SF-12 measures across groups in four tests of clinical status and clinician assessment of change (CKD-specific tests), and number of comorbidities. ANOVA was used to test for group mean differences, variances in each measure explained by groups, and relative validity (RV) in comparison with the referent KDQOL-36 Burden subscale. Results KDQOL-36 and CKD-QOL measures generally discriminated better than generic SF-12v2 measures. The pattern of variances across CKD-specific tests comparing validity favored CKD-QOL two-fold over KDQOL-36. Two RV test results confirmed CKD-QOL improvements over the referent KDQOL scale. Results for static and CAT CKD-QOL forms were similar. SF-12 Physical and KDQOL-36 Symptoms scores worsened with increasing comorbid condition counts. Conclusions Overall, compared with the KDQOL-36, the new approach to summarizing CKD-specific QOL impact performed better across multiple tests of validity. CAT surveys were more efficient than static surveys.